This buddy system has also added new Easter eggs and has been confirmed by reddit user AMart83. 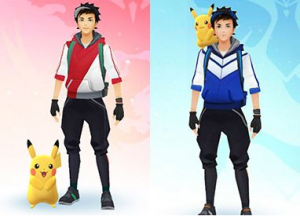 If you walk 10km with Pikachu as your Poke Buddy then he jumps onto your shoulder. It may mean other pokemon have Easter eggs attached to total walking strength as your buddy outside of their pokeball. You earn candy for your buddy based on your walking distance as well. The update blocks any user with access to the root of their phone from playing Pokemon Go. This update is an attempt to make cheating the game harder, mainly to help prevent GPS spoofing while playing Pokemon. I understand the reason and it is a noble cause but it will be effecting a lot of players who weren’t cheating in Pokemon Go in the first place as many people have rooted devices, aka Jail Broken devices. The android police have released a workaround to show how you can play Pokemon Go on a rooted device with the new update. We have all been through the aggravation of missing a Pokemon because you couldn’t click it on the screen as it was too small. I normally have this issues around gyms and poke stops. Per the update notes it is now easier to click the smaller pokemon on your screen. There aren’t too many things in the game as aggravating as walking 10km to hatch your egg only to find out it’s already been hatched and the animation just never happened! That is part of the fun and as you watch in anticipation hoping and praying it’s not a Pidgey hatching. The update helps to ensure the animations for hatching eggs occurs on every hatching. Here is an animation I don’t mind missing! 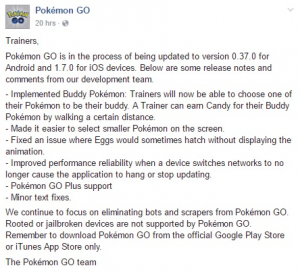 Other updates are minor text updates, Pokemon Go Plus support and improved performance. Reddit users have also confirmed that scoring over the data have found Ditto and all the other original legendary Pokemon listed in the source code of the game. While no one has ever found these Pokemon it is highly likley they will be some sort of special event pokemon. The source code does show they have been added to the buddy system which means that yes these legendaries will be usable in battles! Below are the kms from the buddy source code for Legendaries.